Over a thousand athletes are expected to line out for the 20th annual Rathfarnham 5km on Sunday September 24 (10.0) – a race known for its quality up front and for fast times. Last years, Mark Christie from Mullingar Harriers just edged out Freddy Sittuk of Raheny Shamrock with both men given a time of 14 mins 26 secs. Women’s winner in 16 mins 42 secs was Laura Shaughnessy of DSD, with Borrisokane’s Siobhan O’Doherty second. Sittuk was leading Raheny to team victory in the men’s race over host club Rathfarnham WSAF. Best of the women’ teams was Crusaders led by Caroline Crowley in third place. Of the 900-plus finishers, eight broke 15 minutes, 29 finished in under 16 mins and 427 in under 25 minutes, with many recording personal best times. Online entry is available for €21.40, with all who enter before Thursday September 21 guaranteed a quality t-shirt and goodie bag which can be picked up on the morning at Terenure College from 7.30 to 9.30am. Upfront, the race winners will received a cheque for €400 plus an extra €100 if they break the course records – senior men 13 mins 52 secs, women 15 mins 25 secs and Under 20 men 14 mins 18 secs. The cross-country season is just around the corner and two hardy annuals are scheduled for Sunday September 24. Kilmacow in Co Kilkenny is the venue for the 40th annual St Senan’s AC Open Cross Country that day(1.0), and to celebrate both the anniversary and the noble Irish tradition of cross-country running, St Senan’s is aiming to have 40 teams run in the senior races. For this they need YOUR support. So how about it clubs? Greenenastown in Co Meath is the venue for the 29th annual Star of the Sea AC Cross Country. As usual, the programme starts at 11am with the U9 races and juvenile programme. The women’s 3km race starts at 1pm followed men’s 6km; both these races are open to junior, senior and master runners and teams. Juvenile athletes pay €3 at the gate and go to the line as their race is called. Adult admission at the gate is € 5. Junior, senior, master and Fit4Life athletes must register and collect a number at the entrance gate; fee is €15. Info Brendan Meade 087 2533113. 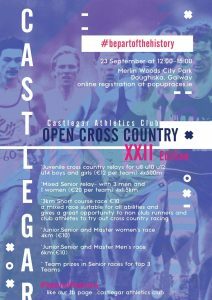 Here’s another cross-country: the 22nd edition of the Castlegar Open Cross-Country races on Saturday September 23 (12 noon) at Merlin Woods Park, Doughista, Galway. The races, which ran from 1975 to 1995, were successfully revived last year and this year will include juvenile relays. and a new course which will be entertaining to run on and to watch. On another matter: what races would you include in an annual road running league? It’s way past time we had such a league, taking in the best club races from both sides of the border. The Rathfarnham 5km would definitely make it.